Last month Bing launched their WorldWide Telescope application that allows you to look at the stars and constellations from Bing Maps. The application shows real time information on how space is moving around Earth. 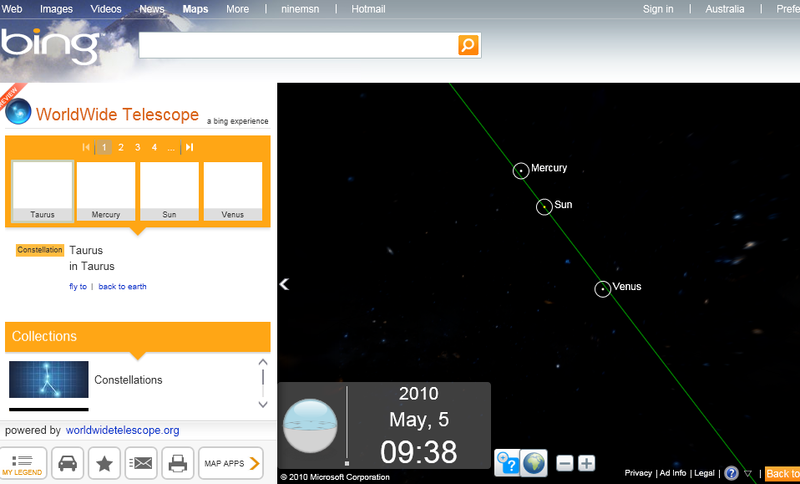 To download the Telescope App go here, click the MAP APPS button at the bottom of the page, then WorldWide Telescope. Follow the prompts and this will install the Microsoft Silverlight client inside Bing Maps. This will show a Telescope icon on the left hand side of the page which you can drag onto the map and will show you the stars, regardless if it is day or night! Here is an example I got from Sydney CBD, great tool for amateur astronomers!